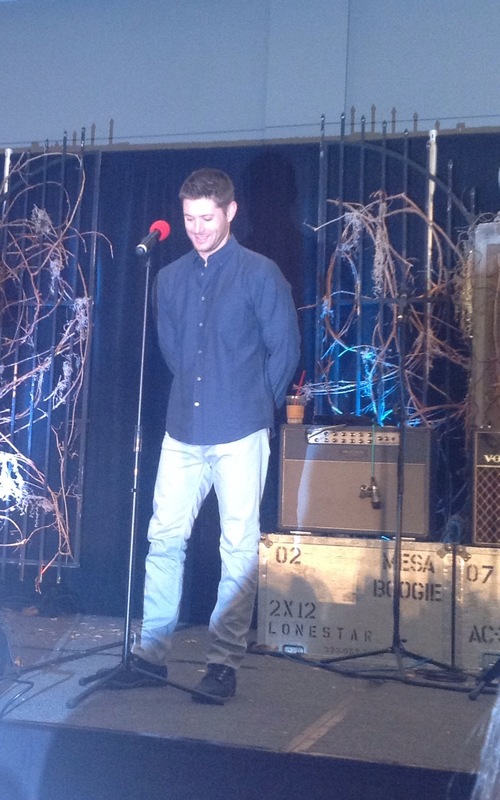 Last year at Jensen’s meet and greet at Burcon, the unbelievable happened when I forgot to go to it. Yes, me. Forgot. Blame the Supernatural writers, who were such fascinating conversationalists that I totally forgot I was supposed to be somewhere else. Believe it or not, I was almost tardy once again this year (though I can’t blame the writers again). Cue me frantically trying to figure out where the room is and then jogging over. I finally find it and compose myself, and am walking what I hoped was casually down the hallway to the room when someone comes up behind me and puts their hand on my shoulder and a deep voice says “I’m right behind you, Lynn!” Let’s just say I was already on edge, so I jumped a foot. It didn’t exactly calm me down that it was Jensen. At least I didn’t actually miss any of it this time! I was still in a 200th episode euphoria, and couldn’t wait to hear Jensen’s thoughts – and he didn’t disappoint. 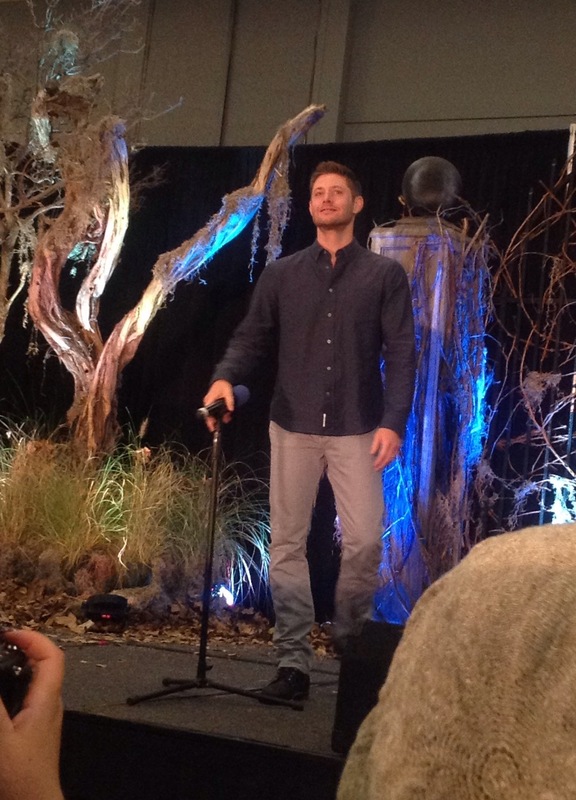 Jensen had a lot to say about the evolution of his thoughts on the episode. He was initially skeptical, wondering if they should “go there”. So skeptical that he went to talk to Jeremy Carver at his office for the first time. He asked if they really wanted to put into the show some of the things they’d kept out of it until now. They’d kept a division all this time [in other words, kept most of fanon separate from canon]. Did they want to take down that separation? His conversation with Jeremy made him feel a little better, but not completely. Walking out of the writer’s office, he ran into 200th episode writer Robbie Thompson. Robbie: What did you think of the script? And he was totally on board with that. Jensen: We’ve talked about this a lot, Lynn. It’s true. 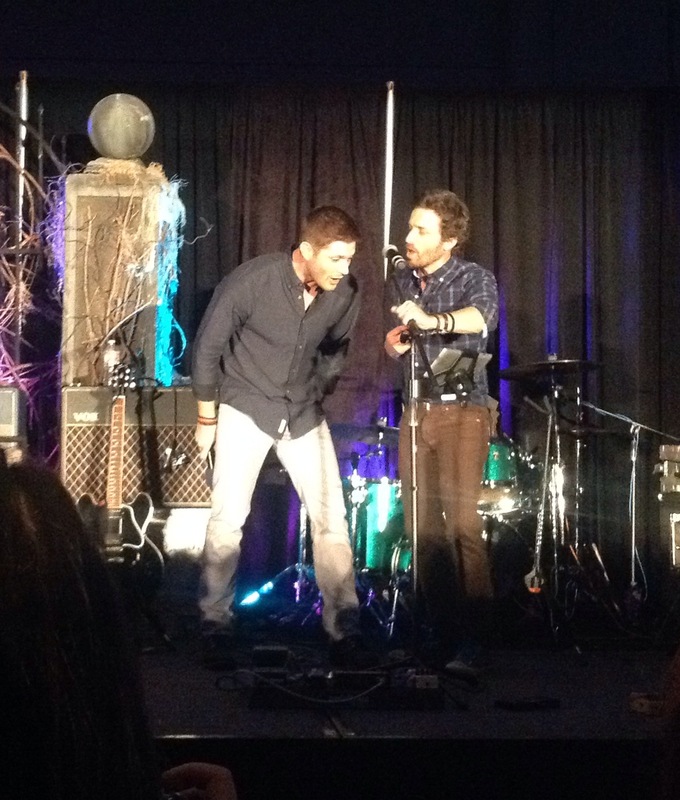 We’ve talked about fandom and creativity and interpretation – there are some great insights from Jensen, Jared and Misha in Fangasm: Supernatural Fangirls. And I think I said almost exactly what Jensen said in my episode review last week, so yay! Jensen: I was concerned that it would backfire, but once I understood that, I was on board. Me: Having talked to Robbie a lot about fandom, I was pretty sure he would get it right, but I was still nervous too. It’s always a risk when a Show depicts its fans. But I loved it – it was perfect! My favorite episode of all time, I think. 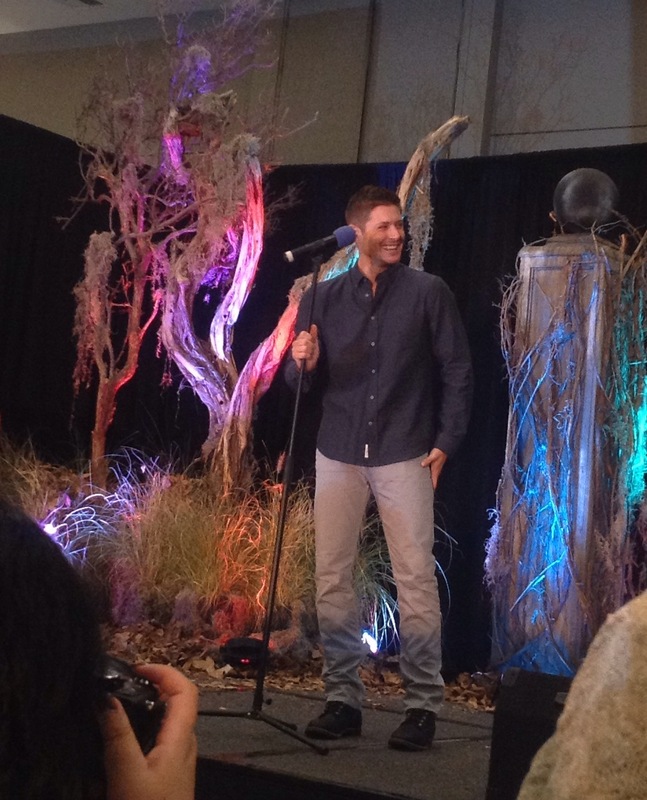 Jensen: (smiling) I’m so glad. Jared and I also thought it was great. In other words, Jared and Jensen are on the same page as fandom right now. And doesn’t it feel good? Later that day, Jensen brought the 200th episode up again to me, saying that I’d surprised him by saying it was my favorite episode ever. 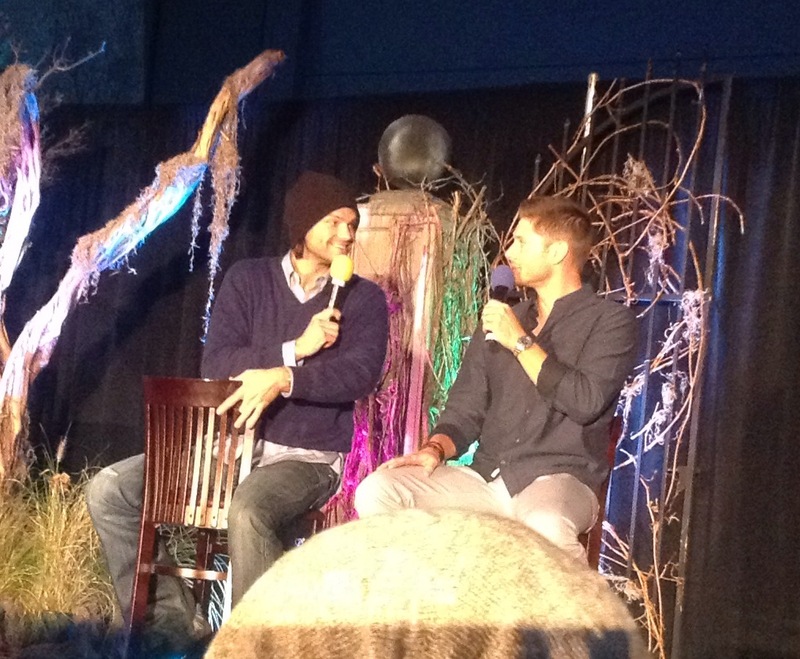 Jensen: That’s really saying something, coming from you. Me: It is, but I mean it. It wasn’t just a good episode, it was an important one. And, you know, it’s what we write about, the reciprocal relationship between fans and the Show. Jensen: (smiling and nodding) I know. Me: (smiling too, perhaps even more broadly…okay, definitely more broadly) I know you know. Fascinating conversationalist I can be when chatting with the likes of Mr. Ackles. But if you’ve read Fangasm, you’ve seen multiple examples of that. Alas. Another fan asked where Dean’s story line is going this season, and Jensen said again that the mark on Dean’s arm is a big part of it. Someone asked whether the brothers would talk more about their epic differences of last season. You know, have an actual conversation and work things out? Jensen said not really. He went on to say that the fact that the brothers haven’t talked through all their differences – that they’re just going to go forward – adds more layers to the characters. 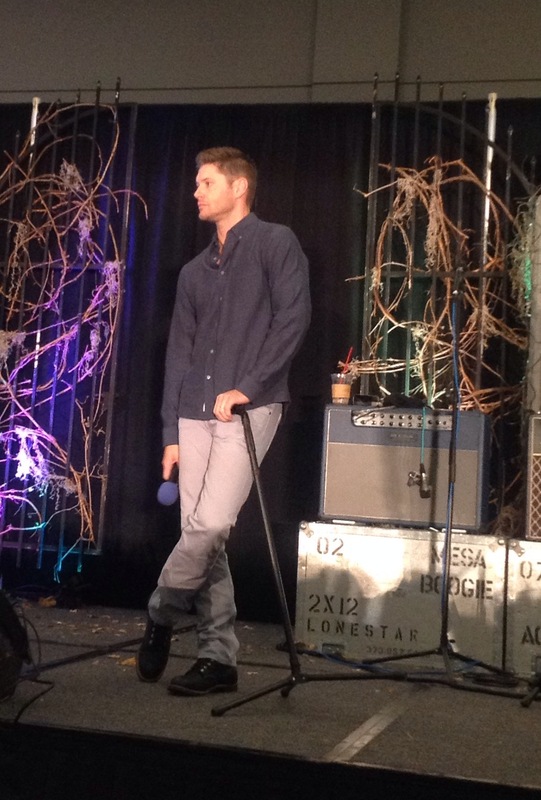 Jensen: They’re macho men, and they’re going to go forward with this added baggage. 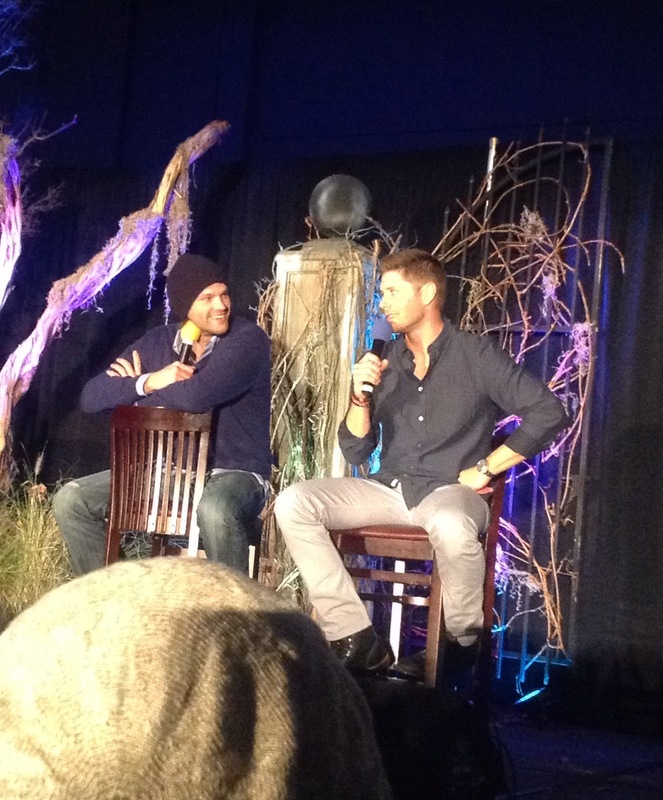 Jensen said he likes that there are layers and complexity to the Winchesters, though. Jensen: I’m a fan of the storyline of Dean being more complex. He stressed once again, though, that the brothers are together in trying to figure out how to get the mark off Dean’s arm. Jensen: It’s the two of them together. The brothers are very much back together and me and Jared are happy about that. We often say that with the brothers, the sum of them is greater than the parts [Sam and Dean as individuals]. Jensen: (laughing) Not hug, I wouldn’t go that far. But when they’re fighting on the same side. He also talked a bit about directing, saying that he started asking questions about logistics and things like that because it would make him a better actor. Kim Manners told him a long time ago that “you’ve got the eye” and a way of looking at those things, and that he would direct someday. At the time he just said “What? No.” But Kim put the idea in his head, and started him thinking about directing. Jensen: (beaming with pride, which was seriously adorable) I was really proud of that shot, the way they brought it around for the reveal. Finally, a few family-related tidbits. Jensen told some adorable stories about JJ, who her mom has nicknamed “Jaybird”. Jared’s son, Tom, has a bit of a crush on her, since the Ackles and Padalecki kids play together all the time. 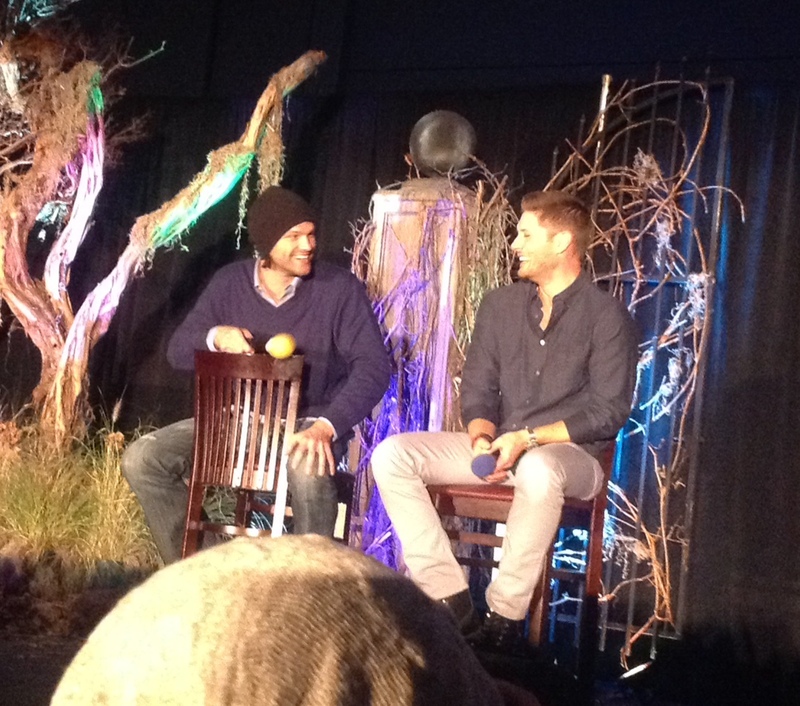 Jensen: Jared and I joke that JJ will have her choice of Tom and Shep, one older and one younger. Fan: And if Jared has a daughter, that’s three choices. Jensen: Sure, I’m fine with that! I have a feeling little Princess Ackles is gonna have her pick of whoever strikes her fancy. Jensen was rather proud that when another little boy came up to JJ and complimented her on her Halloween costume, she just tossed her head and turned away. Jensen: And then Tom came up and punched him in the face. No, I’m kidding! In other family-related talk, Jensen said his father was his biggest inspiration, and that his mother was equally inspirational. He said that both his dad (who Jared is close to also) and Jared’s dad (who Jensen is close to) still give them advice, even though they’re grown men. SPN Family, y’all. Seriously, it’s for real in so many ways. Another fan pointed out that he had said that he wasn’t going to do any singing at cons, but that he’s seemed to change his mind. She wondered why. More seriously, he said that there are so many familiar faces at cons, he feels comfortable, so he’s able to do more of those things. Jensen: We feel comfortable with you guys. You know us, we know you, and that’s how we like it. We want that level of comfortability with our fans. And that’s what we have. We’re all in this together. We share this passion and love for this great Show, we’re fans of it too. Fan: So, will you sing today? Jensen: (laughing) I’ve learned never to make those kind of promises. Wise man. Though he did join Louden Swain for a bit of “Lose Your Love” to close out the con, which has become a tradition. 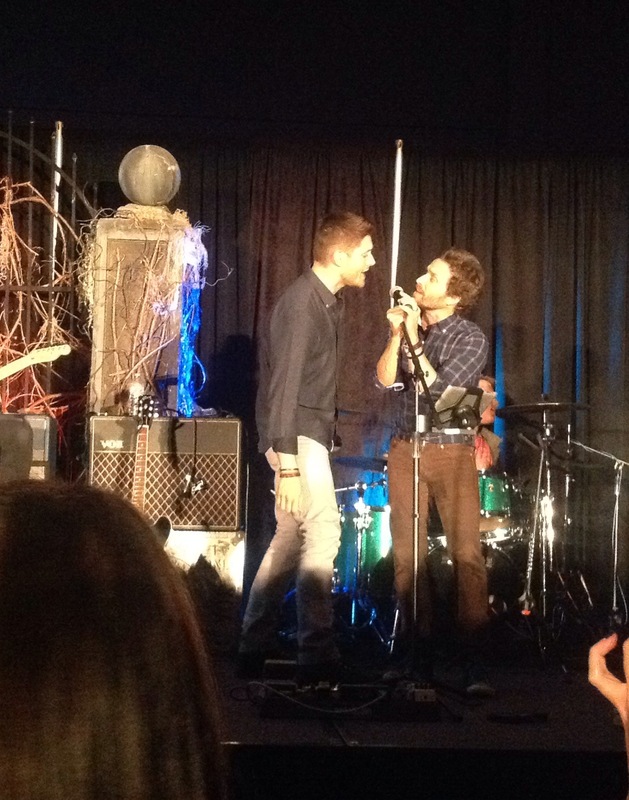 Here’s hoping that 2015 cons bring us a lot more Ackles singing! Stay tuned for more photos and coverage of Burcon, including our chats with the delightful Joy Regullano, Maeve from ‘Fan Fiction’ and the equally delightful Curtis Armstrong, who is absolutely nothing like Metatron. Thankfully. It was wonderful to catch up with Robbie Thompson and Jenny Klein too, and to meet the vivacious Katie Sarife, who enjoyed karaoke almost as much as I did! I had an amazing time and met so many wonderful fellow fans, many of whom came by the vendors room to tell me what reading Fangasm had meant to them. One fan jokingly asked, “Have you been reading my diary? This is my story!” Which, seriously, is the best compliment ever. 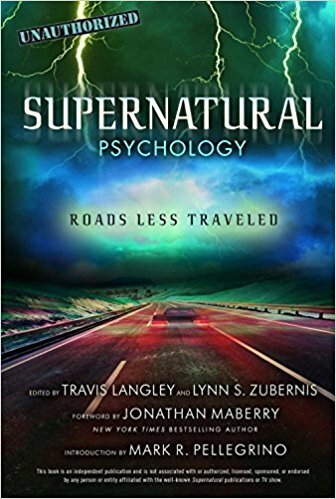 Thanks to everyone who came by to say hi – and if you bought a copy of Fangasm or Fan Phenomena Supernatural at Burcon, don’t forget to let us know what you think! NGL. Still terrified about going to a con. Going next August to Minnesota. Your books/reports help. So much love for this. So sad I couldn’t be there. Burcon/LaCon feels like my home con because it was my first and is always special in some way. And I missed seeing you and all the others that usually attend this con. 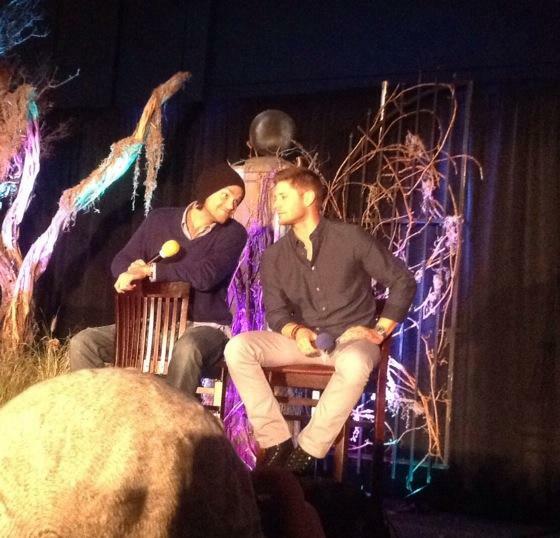 Loved hearing what Jensen said about the brothers and about the 200th ep. I can’t recall-will you be at SFCon? Great interview and comments, thanks again for keeping us all up to date. Nice to hear thoughts from the actors and writers! I really enjoy this site! I plan on attending my first convention next year in Denver! Always lovely to get a peek into Jensen’s meet & greets! Though regarding your comment about Jensen and Jared being on the same page as fandom with the 200th, that is certainly not true for me because I hated it. Thank you for keeping us up to date on the J’s. I normally never leave a comment but just wanted you to know that I feel I know and understand the J’s and the show a little better when I read your reviews. I don’t know why it isn’t discussed more, but I feel there is something groundbreaking with this show regarding the divide between the network, the series and it’s fans. I think over the next few years there is going to be a shift in how other networks approach communicate and interact with their fans and I feel in no small part due to SPN showing the way. But I must say fundamentally, it has a lot to do with the J’s incredible integrity and commitment to the show and their fans. So interesting to read about Jensen’s initial reticence about “Fan Fiction.” It makes me face my own reluctance to lower that final wall between fan and object, which you seem to bridge so effortlessly! I can’t imagine meeting Mr. Ackles — it would completely destroy my weird need to pretend he doesn’t exist so that I can keep writing fan fiction about him! Does that make me a psycho?! (or maybe just ridiculously shy…) Anyway, I live through your close encounters, so thank you again for this! Thank you so much! I love Jensen’s Meet & Greets, he’ s so adorable! Hi! I bought fangasm at burcon and literally inhaled it on the plane ride home. I loved every word and could relate to a lot of it personally. Thank you for signing my copy! I didn’t have time to come back by the booth to get the second book but will buy it and if you have a booth at the Denver con I’ll bring it along and maybe you can sign that too. Also, thanks for reporting a little on Jensen’s m&g, It’s reassuring to read that he’s in it with us, you know.